In the past two decades, astronomers have detected more than 2000 exoplanets, the first of these detections were gas giants as massive as Jupiter that are so close to the host that they are heated to high temperature in order of 2,000°C; but now, for the first time, astronomers are getting down to the regime of potentially habitable Earth-like worlds. The goal of space exploration has always been the same, to try to answer the oldest scientific question: are we alone in the universe? Why limit ourselves to exoplanets? The search for alien life doesn’t end with them; Increasingly, astrobiologists watch the moons in our own solar system for the hint of biology, if the so-called exomoons can also have potential life then it will be more habitable moons than planets within the cosmos. But first, just as a reminder: an exomoon is simply a moon which orbits an exoplanet and remember, an exoplanet is a planet which orbits other star than the sun, so these exomoons are just moons going around planets around stars other than the sun. So far, we haven’t discovered and confirmed exomoons but we know thousands of exoplanets, so we are sure exomoons are there, we simply lack the sensitivity to detect them — to date, there are only three exomoon candidates. Exomoons’ idea is really interesting, there is no reason why you couldn’t have an Earth-like world as moon going around a massive planet as Jupiter and, don’t forget, exomoons doesn’t depend on how far away from the heat of their star they are. Remember the world of Pandora in the epic movie Avatar? Well, that wasn’t an exoplanet, it was in fact a moon orbiting a massive exoplanet. Our solar system has some fascinating moons orbiting Jupiter and Saturn that, may not look like the SF rain-forest moon of Pandora, but they do have vast sub-surface oceans beneath their frozen crusts — the water is heated to a liquid by tidal forces squeezing the insides of the moon creating a heat source — no sunlight required! René Heller, an astrophysicist at the Origins Institute at McMaster University, said. The first challenge in studying exomoons is to actually find one. For detection, current techniques mostly focus on light curve analysis. The concept is that the exomoon alters the light curve in a specific and identifiable way. Other methods also have been proposed, such as direct imaging, radial velocity measurements, microlensing, or pulsar timing. Today, scientists use Kepler to search for moons orbiting alien planets, with a project called the Hunt for Exomoons with Kepler (HEK), the first systematic search for exomoons. Astronomers simulate billions of possible star-planet-moon arrangements using NASA’s Pleiades Supercomputer. They then compare the results with actual data taken with Kepler telescope, if one of the simulated combinations matches the Kepler data, that area warrants further exploration. said David Kipping at the Harvard-Smithsonian Center for Astrophysics, lead astronomer of HEK. Occultation light curves of exomoons may give information on their albedo, or reflection coefficient, and hence indicate the presence of ice cover on the surface. 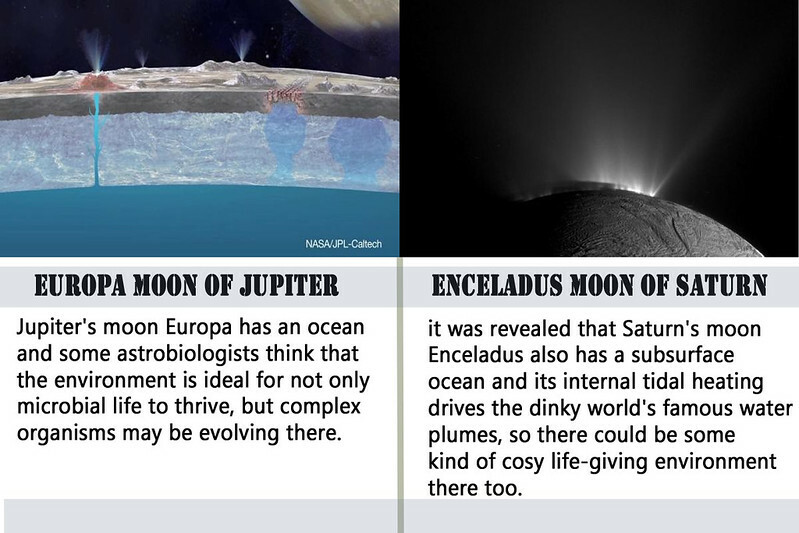 Icy moons might have subsurface oceans thus these may potentially be habitable. In a new work, uploaded on arxiv servers, astronomers applied some simple calculations for different stellar masses and compared the flux drop caused by the moon’s occultation and thus they found that the albedo estimation by their method is not feasible for moons of solar-like stars, but small M dwarfs are better candidates for such measurements. Although most search projects focus on solar-like stars, M dwarfs as targets should also be considered, because of more than 70% of the stars are of M spectral type. But in theory, red dwarf stars, which are smaller and cooler than the sun, tend not to produce particularly massive gas giant planets so it is possible that no large exomoons are present around them. But based on the discovered exoplanets currently 68 M dwarfs are known to have 96 exoplanets, from which the heaviest planet’s mass is 62 Jupiter masses (Mj), 20 other exoplanets have at least 10 Jupiter-masses, and there are 13 other planets that are heavier than 1 MJ (source: exoplanet.eu, January 2016). So, the average mass of the exoplanets of the 68 M dwarfs is 4.8 MJ. Moons of smaller stars seem to be easier to detect, if their stellar distance is smaller. In addition, the smaller the star, the closer the snowline located, meaning that rocky bodies can stay icy even if they are orbiting the star in a closer orbit. The vicinity to the star makes the body brighter, thus an icy exomoon is easier to detect in occultation close to the snowline of an M dwarf, than at the snowline of a solar-like star. So, based on these observations, astronomers assume that geometric albedo above around 0.7 (for reference, Europa with 1.02 and Enceladus with 1.38 geometric albedo) indicates some ice, often water ice, with relatively young surface, and higher albedo might suggest freshly fallen water ice crystals — thus may potentially be habitable or at least could be considered as favorable environments for life. With the next generation of telescopes expected soon to be launched, the exomoons might not be able to hide for much longer.